Carpet of Joy Saligao Goa, India is best known for its pristine coastlines, rolling hills and exemplary marine, plant and animal life. But this ecological haven is steadily eroding. Plastic litter is everywhere. How do we shake up the apathy and get people to start caring about the environment again? How can we inspire, create and assemble to clean up Goa and India? Museum of Goa, led by Founding Director and contemporary artist Dr. Subodh Kerkar will employ 1,50,000 discarded plastic bottles painted and crafted to look like flowers to cover 2,000 square meters of space near Saligao Circle, Goa. This “Carpet of Joy” will protest plastic litter by juxtaposing the toxic and the organic, questioning why litter is so often more visible than the beauty of our natural landscapes? When does it end? What can I do to stop it? To create a cultural emblem for environmental education, social awareness and a movement – propelled by every single one of us – to restore the oceans, hills and forests we’ve lost beneath growing piles of toxic waste. 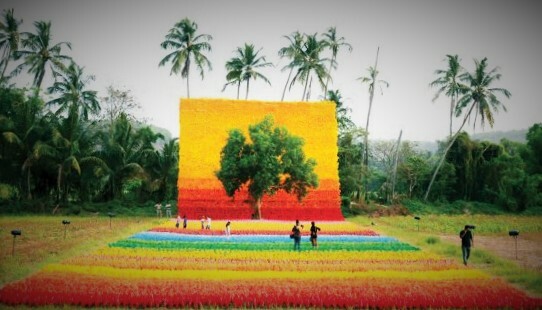 The installation will comprise of 3,000 children using discarded plastic bottles will create 150,000 flowers of different colors that will be joined to form a 2,000 square meter carpet rising 12 meters high into the sky with a 9-meter tree rounding out the installation which will show the contrast of toxic and organic. Carpet of Joy drawing is inspired from the Israeli architect and artist, Uri de Beer.